Witherspoon is a family owned and run business which has been serving customers for over 45 years. We service and repair all makes and models and specialize in Volkswagen, Audi, Skoda and SEAT vehicles. Under current EU rules and regulations you do not require to go back to the dealer. Whatever car you drive, new or old, your warranty and your residual value are protected, you no longer can be penalised for not having the dealership stamp in your service book! Ravelston Place is conveniently situated in central Edinburgh leaving no more than a 15 minute walk into the city centre, we have moved back in town whilst others are moving further out! 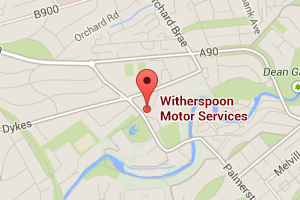 Witherspoon is also equipped to look after all makes and models. We can cover all aspects of work. Customer focused on servicing and repairs. We are not a car sales dealership. Our workshop is fitted with the latest equipment to keep your vehicle in perfect condition. Cater for all of your motoring needs. Private car acquisitions and disposals. We have not moved out of town! We are happy to discuss your servicing or repair requirements, our contact details can be found here.